On Tuesday, voters handed Democrats the House of Representatives - and may have also rendered a verdict on President Trump's signature tax cuts. 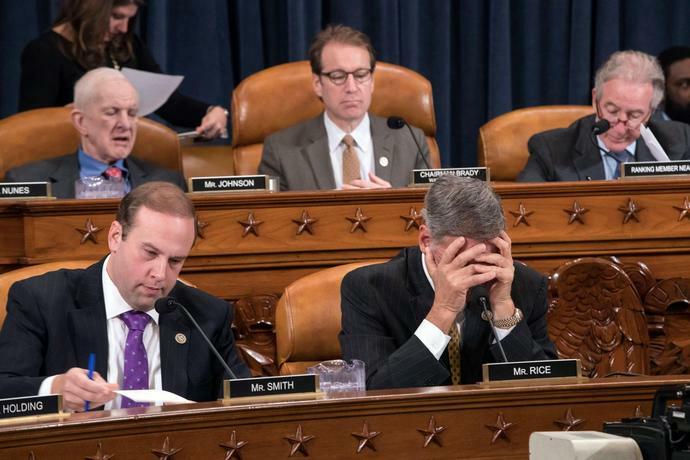 The House Ways and Means Committee, which oversees taxes and trade, saw four of its Republican members lose their seats. Those four defeats come after five other Republicans on the committee already left mid-term or decided to retire. With three more committee members running for other offices, come January, half of the 24 Republicans who wrote the 2017 Tax Cuts and Jobs Act will no longer be in Congress. Those tax cuts, designed to create jobs, have widely been viewed as President Trump's signature legislative achievement. Nonetheless, their emphasis on business taxes tended to favor the wealthy over the middle-class - and proved broadly unpopular in the run-up to Tuesday's election. To be sure, some of the Republican tax-cut authors are leaving Washington on a high note. Kristi Noem won the election to become South Dakota's first female governor. However, the two other committee members who left Congress to seek other offices, Diane Black and James Renacci, both lost their races. The four men who lost their seats Tuesday night were vocal supporters of the Tax Cuts and Jobs Act on the campaign trail over the course of the year. Dean Heller, R-NV, was the sole Republican loss on the Senate Finance Committee, while one Democrat, Claire McCaskill, D-Mo. lost her seat on that committee. Bill Nelson, D-Fla. will be the second Democrat to lose his Finance committee seat if he fails to overtake incumbent Gov. Rick Scott in a potential Florida Senate recount.